but in the very best way. Every bone, every muscle is crying out to go back to bed, but I think I’ll hold out for an afternoon nap. The opening of my show was a HUGE success. Tons of wonderful friends came by to support me, my little family came by (even though they’ve been living with these pieces for months now, and lord knows they are sick of me!). My most wonderful Aunt and Uncle drove all the way from Vancouver, B.C. for the show! and I met a group of women from the local Surface Design Group – all of whom made me laugh and I can’t wait to hook up with them again! My heartfelt thanks go to my dear friend Mary Mac who convinced the membership at Parklane Galleries to take a chance of “plush art”. I made her a little robot. 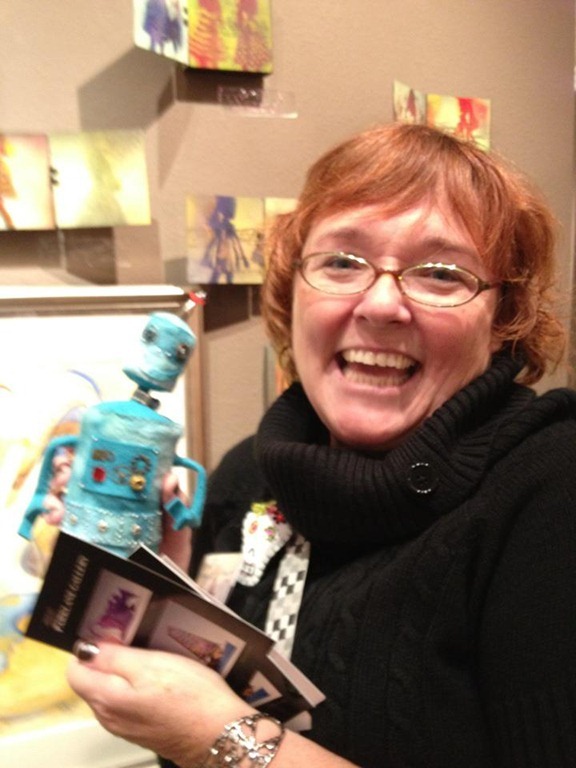 She took this goofy picture of me with her robot, in front of her small pieces (love!). This was after she pinned one of my sugar skulls to me and my name tag on me (and I still hadn’t had time to put down my purse). 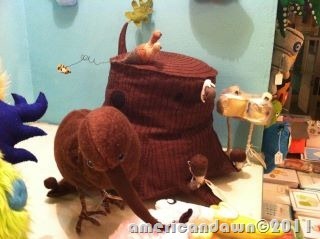 My friend Dawn took this picture of my pieces at Plush You! in Seattle. I’m heading down today to see the show. My family went as well, and by all accounts, it is amazing. I can’t wait to see it.